Midweek and the work is pouring in. Arrgh.. somebody turn off the tap please. Alternatively, sit and wait at the phone and hope some kind soul (like for example, someone like Marian), calls to invite you for some nice dinner, not too far from home. Oh someone up there heard me! My prayers were indeed answered and that night, Marian invited Cumi & Ciki, A Whiff of Lemongrass and BE, The Nomad Gourmand,(TNG) A Lil fat monkey and McCutie to dinner at New Formosa, hosted by Jeanie the owner of the restaurant. First dish for the night – Yee Sang! This dish usually consists of strips of raw fish mixed with shredded vegetables and a variety of sauces and condiments, among other ingredients. Yee Sang literally means “raw fish” but it could also mean, an increase in abundance. I like Yee Sang because it is mad fun. Half the mayhem is in tossing the salad with chopsticks. Sometimes more of the yee sang ends up on the table rather than in the dish. That’s ok, it just means that you are really good at Lo Hei and well on your way to increased prosperity, abundance and vigor! 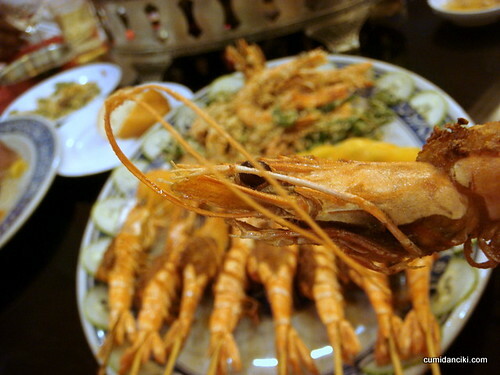 This dish is extremely popular amongst Business men, Genting Casino goers and Stock market speculators. 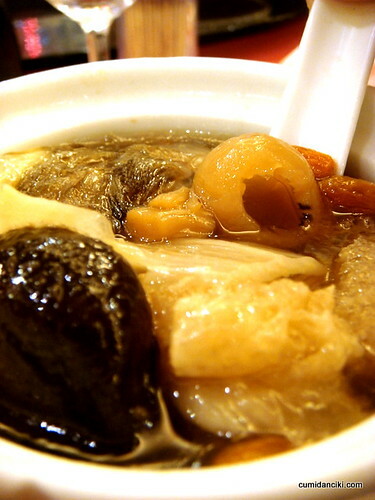 Prepared meticulously and integrating an epic number of expensive ingredients into a refreshing and wholesome soup, the final result forms a divine, flavourful concoction that is believed to revive and balance the Ying & Yang in the body. With a history of almost 200 years, the name implies that it is so appealing, even a monk could not resist and would sneak out of the monastery and jump over the wall to relish it! We ourselves found this soup nothing short of amazing. 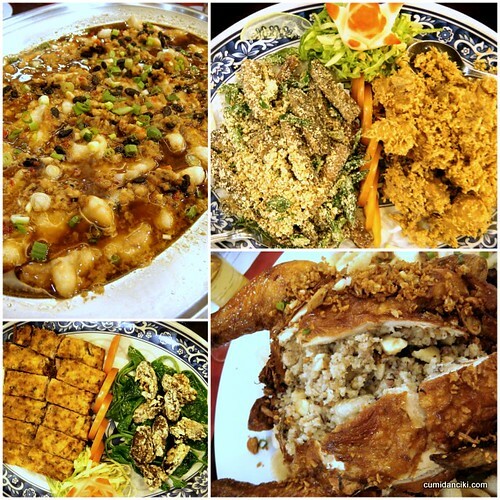 Top left on the collage is the phenomenally tasty Steamed Long Tan (grouper) Taiwanese style. The other way to described it as Nian Nian You – every year with extra fortune ! What an auspicious dish. This was basically steamed fish with black fermented soy and minced ginger and garlic. Bottom right on the collage is the Feng Sha Jie, which is the roasted chicken with red scallions, garlic dressing etc, stuffed with eight treasures. Once you cut open the soft roasted flesh with a pair of scissors, it will reveal an interesting interior of unpolished rice, 3 types to be exact – brown, red and black glutinous rice, together with crunchy chestnuts, lotus seeds, black mushroom, scallion, dried shrimps and etc. 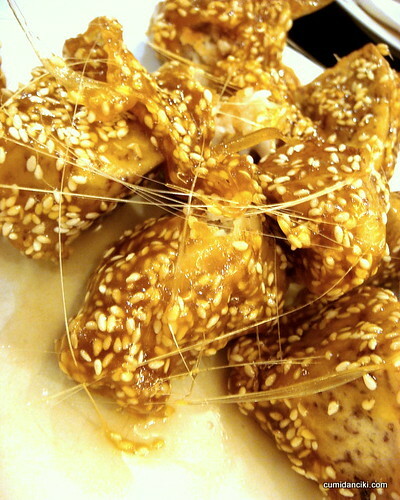 The Eel, Dried Oysters platter and the Yam and Duck Tart were all nicely battered and had a nice crunch to it – I guess you could say that that sort of sweet and salty crispy batter is characteristically Taiwanese in texture and taste. This next dish was my absolute favourite of the night – the Gingko Ham.. eaten with mantou (buns). 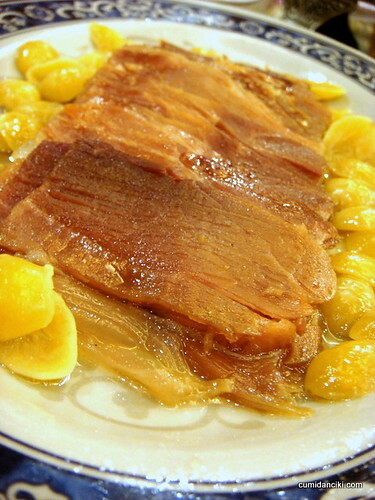 It looks like an easy enough dish to prepare, this sweetened honeyed gingko ham, but do not be deceived, it actually requires tons of work and laborious hours slaving in the kitchen just to get rid of the high amount of salt in the starting material i.e. the ham. This ham is steamed over and over again until most of the salt is leached out of it and it starts to take on the right flavour. Amazing! Eaten together, the mantou seals in the gorgeous meaty ham aroma and the sweetness of the honeyed gingko. Lovely! Enter BBQed prawns and butter prawns. Both equally tasty and cooked just right. The flesh was still taut and not overcooked. 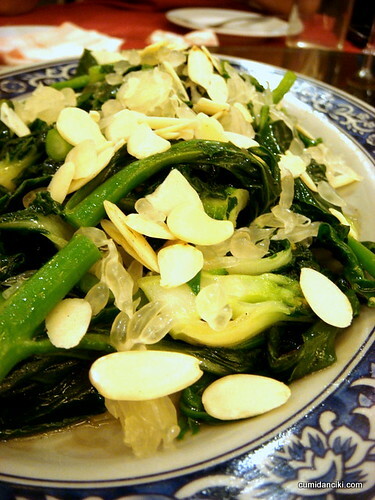 Greens cooked with Pomelo Sacs and Almond Flakes. Interesting and effective. It converted an otherwise boring vegetable dish into something with fun textures and flavours. 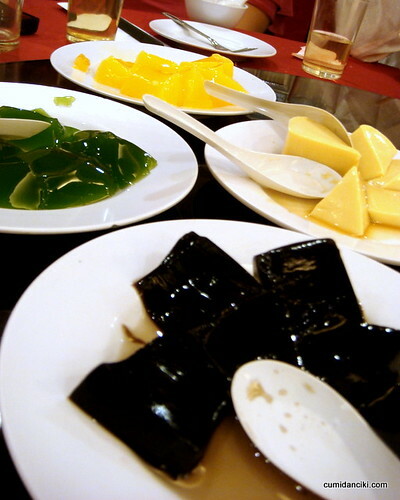 Honey herbal pudding, custard caramel pudding, green tea aloe vera pudding and mango pudding. All great if you are a fan of the pudding. I found these desserts refreshing but not something I’d go ga-ga over. This one I liked. Orh Nee is insanely delicious AND an extremely fattening dessert! Well, the original version anyway, is sickeningly sweet and fattening as it contains pork fats and syrup. Apparently how you do it is, you fry a piece of belly pork (with lots of fat) with garlic, then you add pieces of yam and ginkgo nut and cook until the whole combination is soft and swimming in a layer of oil. Then you pour in some thick sugar syrup to give the dish a more dessert-like feel. Today, this is still hard work but the dish tends to be a little healthier. 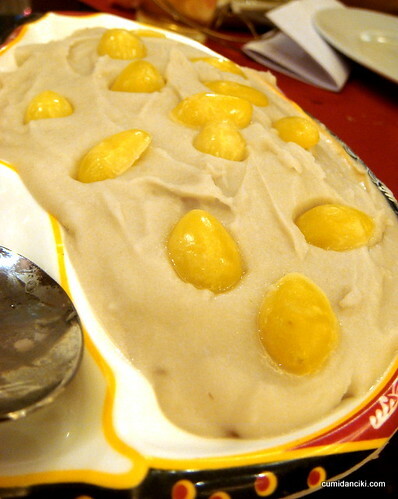 The cooked yam is mashed and mixed with gingko nuts before being cooked with sugar water until it forms a paste which should ultimately be so smooth that it goes down your throat like cream. Some restaurants still retain a piece of fatty meat or lard in the mixture and this helps to make it even smoother. Other places add pumpkin pieces to the mixture giving the taste a slightly different texture. Finally, Honey coated fried yam. 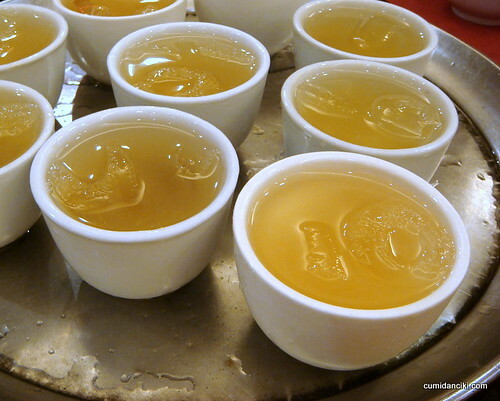 They dunk these in cold water and the outer sugar coat freezes to give you a crunchy sweet shell. Biting into this reveals the soft, savoury yam. Also a brilliantly fun dessert to watch them prepare and every bit as delicious as the Orh Nee. It is a really beautiful and auspicious dessert to look at. Like golden nuggets with golden inter-woven threads. The more threads the more well done this dessert.. and I suppose the more prosperous the guests who eat them will be! Gold Nuggets galore. For two other concise write ups on New Formosa complete with price-list and all, please go here and here. 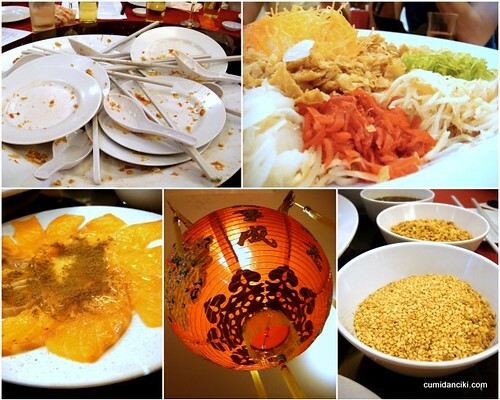 Wishing everybody out there a Happy Chinese New Year.. Yam Seng ! To your good Fortune and may your pockets be overflowing with Gold Nuggets in 2010! Next articleManic Monday – Don’t forget your punctuation! Thank you very much for your favourable food review. we really appreciate it. 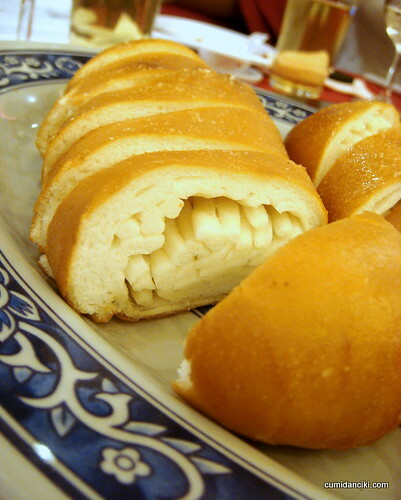 i love your lively sharp special angle photos; Chinese silver bread, soup and dessert which i used for our 2011 new menu. Wishing you all the best! Haha, that’s a funny picture of TNG through the sugar strings! yar, we are hungry ghosts la.. whack everything! yar, it’s really value for money ..
its work work work until this friday!! cant even find time for gym. The or nee was so good lah. Actually, everything was very good that night. Jeanie did a good job with the planning of the dishes. the ginko ham looks so interesting, it taste sweet? Yikes! am i the only one in the grp not yet posted?? am i am i? Oh dear.l..hungry di looking again at yr pics. note to self: Must go try their steamboat!